Kitchener, Ontario - Representatives from all parishes and church-school congregations gathered at the Holy Trinity Serbian Orthodox Church in Kitchener, Ontario February 6-8, 2015 around their archpastor His Grace Bishop Georgije of Canada for the 33rd annual Diocesan Assembly. This great assembly brought together a total of 86 representatives from Serbian Orthodox Churches throughout Canada - all diocesan clergy, presidents and delegates from church boards and parishes and representatives of organizations. The work of the Assembly was in five committees: the Missionary-educational, legaslative-administrative, publication, financial and resolutions committee. Motions from the committees were then taken into consideration in the plenary where decisions were made based upon which diocesan bodies and church school congregations are to take further action. Besides the decisions of the operative nature which relate to the daily work of the Diocese and its churches in the year 2015, brought mainly upon motion of the Financial and Legaslative-administrative committees, special attention was given to the themes presented by the Missionary-educational committee where, among other things, a discussion ensued about secularism to which our children are subject in the Canadian schools. This discussion began upon the announcement of changes to be made in the Ontario school system by the governement who is attempting - with the prior consensus of the parents - to bring drastic changes of education in the so-called sexual education of students, which has riled the media in this part of Canada. The resolution committee also addressed this theme, questioning the education of our children as the central theme of the Asssembly's resolutions. The successful work of the Diocesan Charitable Foundation "Sveti Car Lazar", that responded quickly to the great misfortune that occurred in the Serbian lands in April of 2014, was greeted. Through this Foundation the "Patriarch Pavle" Foundation was given a total of $611,00 for the flood victims in the Serbian lands. It was also decided that authorization be given only to the Diocesan Charitable Foundation for charitable functions in diocesan church halls and properties. This assembly, which represents the highest diocesan legaslative body, greeted His Holiness Patriarch Irinej and all the hierarchs of the Serbian Orthodox Church, stressing that in the person of the Serbian person our faithful in Canada see the unifying pillar of our holy Church. Greetings were also sent to Canadian government officials. To the letter addressed to Canadian Prime Minister Stephen Harper the unlawful attempt to seperate Serbia from Kosovo and Metohija was mentioned, the "spiritual cradle of Christianity of all Orthodox in Southeastern Europe", and the Prime Minister of Canada was warned: "We maintain that that which we cannot and must not allow in our own homes we must not do in the homes of others". In the letter to Mr. Harper the Assembly also expressed their concern of the erosion of the traditional and family values in Canada. "You brought out attention more than a year ago to your healthy attitude toward human values; the family in the first place. Valuing your efforts in preserving these values, the majority of Canadian citizens, put their trust in you," the letter reminded. In the end, as in all diocesan gatherings, the liturgical dimension of this assembly should also be noted. From the Invocation of the Holy Spirit which began the Assembly on Friday afternoon, then with the Vespers, Vigils and the Holy Hierachical Divine Liturgy in the beautiful Holy Trinity Church in Kitchener, the faithful were able to experience the beauty of traditional Orthodox services, the preservation of which is particularly cared for in this Diocese. 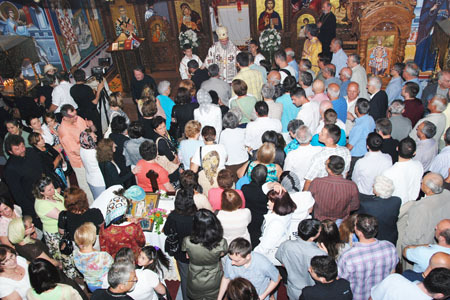 This was best seen at the solemn hierarchical Divine Liturgy which ended the thee day Assembly on Sunday when, together with their hierarch, in the filled church all diocesan clergy served with the "Roman Melodist" church choir singing the responses.